Caviar is one of the world’s most luxurious foods and this small-group caviar-making workshop unveils the secrets of the gastronomic delicacy. Visit a sturgeon fish farm in Neuvic, catch your own fish, and create your very own caviar to take home with you, then indulge in a delicious caviar-themed lunch. 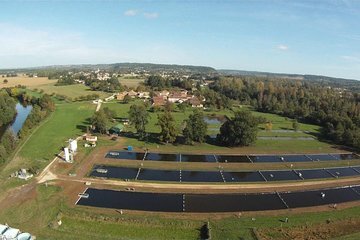 Make your own way to the fish farm in Neuvic, where your guide, an expert caviar maker, will be waiting for you. First, set out on a tour of the fish farm as your guide explains the unique process of fish farming and making caviar. Take a peek at the ponds and get up close to the sturgeon fish, before selecting your own to make your caviar. Then, head to the laboratory, where you’ll be kitted out with special suits and learn the careful process of making caviar. You’ll take part in the entire process, from harvesting the roe (fish eggs), to sorting and salting the caviar, to creating your own 2.2 lbs (1kg) tub of hand-made caviar with a personalized label, ready to take home. Finally, follow your guide to a nearby farm, where a local chef will serve up an indulgent caviar-themed lunch (included).